Take the ride of your life and experience New Zealand ‘Full Throttle’ with Paradise Motorcycle Tours. In the North Island, explore New Zealand’s largest city - the City of Sails, golden beaches, and the geothermal activity in Rotorua. Experience the incredible Huka Falls, see Art Deco at its best in Napier, and meet Wellington – New Zealand’s capital city. In the South Island, ride around Queen Charlotte Sound to Nelson, soak in Hanmer Springs before exploring the wild West Coast. See Punakaiki’s Pancake Rocks, experience Glacier Country and savour Haast Pass - a motorcycle heaven. Go adventuring in Queenstown and visit Milford Sound and its primeval beauty. On the final few days, enjoy the natural and cultural heritage in Dunedin and see Tekapo’s alpine lakes, before finishing your tour in Christchurch. Auckland to The Coromandel 172km/106 miles: Head south, hugging the coastline and enjoying views of the Tasman Sea, before crossing the Hauraki Plains and discovering the Coromandel Peninsula. An area of outstanding natural beauty with fantastic roads for biking. Stay overnight in the gateway to the Coromandel - Thames. Coromandel to Rotorua 208km/129 miles: Ride the circuit around the Coromandel Peninsular and have lunch in Coromandel township. See bush clad hills and enjoy stunning views of the coastline. On the way to Tauranga, take on the Karangahake Gorge, one of the most scenic rides in the North Island. There is an option to visit the film set of 'Hobbiton' where 'Lord of the Rings' and 'The Hobbit' were filmed. Then head to Rotorua, the geothermal hotspot of New Zealand. Free day in Rotorua: Rotorua is one of New Zealand's most famous travel destinations. See boiling mud, hot pools and geysers at Whakarewarewa Maori village. Visit the Agrodome for a sheep-shearing lesson, take a gondola and ride and try the luge, or discover what zorbing is. Tonight you'll experience a Maori cultural show and hangi feast. Rotorua to Napier 220km/136 miles: Lake Taupo, in the centre of the North Island is your first destination, it's a favourite holiday playground for North Islanders. Stop for lunch and visit the pounding Huka Falls. Cross the Ahimanawa and Maungaharuru ranges and ride through the vineyards of Eskdale, before arriving in Napier, New Zealand's home of Art Deco. Napier to Wellington 315km/195 miles: Continue south, through vineyard country and see the Hawkes Bay's orchards. Ride over the windy Rimutakas - just north of Wellington, where pretty houses cling to the hillsides overlooking the lovely Wellington Harbour. Explore the capital city and see the 'Beehive' - New Zealand's government building and visit the fabulous Te Papa Museum. Wellington to Nelson 308km/191 miles: Cross Cook Strait by ferry, and ride the Marlborough Sounds iconic road - Queen Charlotte Drive. Follow the road through dense pine forests to Nelson, Australasia's largest fishing port with its unique microclimate. Nelson has the highest number of sunshine hours in the country and is known for its art and culture. Nelson to Hanmer Springs 300km/186 miles: Ride south over Mt Hope Saddle and through the Buller Gorge. Stop for lunch at the old gold mining town of Murchison then ride the famous Lewis Pass with its world-class mountain scenery. Hanmer Springs, set in a basin of forest clad mountains and home of natural hot springs where you can soak away your aches. Explore Hanmer Springs or Kaikoura: Stay at Hanmer Springs, or take a day trip to Kaikoura. You can go whale watching by boat or from the air. Depending on the season migrating Humpback Whales, Pilot Whales, Blue Whales and Southern Right Whales may make an appearance. Then enjoy freshly caught cooked crayfish on the shore at Kaikoura. Hanmer Springs to Punakaiki 252km/156 miles: Ride Lewis Pass - a fabulous scenic ride and an old Maori greenstone trail. Stop at Reefton, an old gold mining town for lunch then head to Punakaiki on the wild West Coast. See Pancake Rocks, these incredible rock formations and blowholes were 30 million years in the making. Punakaiki to Fox Glacier 240km/149 miles: The West Coast road looks towards the Tasman Sea on the right and Southern Alps on the left. The road is demanding and slow going, but magic riding. The glaciers are awe inspiring, amazing seen from the ground, and even more stunning from above. A helicopter can take you on a trip you'll never forget! Franz Joseph to Queenstown 368km/228 miles: Ride the Fox Hills and visit Lake Matheson - one of New Zealand's most photographed lakes. Have lunch at the Salmon Farm Cafe and before taking on Haast Pass. When you ride this road described motorcycle heaven, you will not believe its beauty. Have lunch in Wanaka and ride over the Crown Range to Queenstown. Explore Queenstown: Paragliding, jet boating, bungee jumping and white water rafting are just a few of the adventure activities that you can try in Queenstown. Or, you could take a ride over the Crown Range to the Cadrona Hotel, visit a vineyard, or explore Arrowtown an old Gold mining town full of cafes and art galleries. Queenstown to Te Anau 190km/118 miles: Take a short but stunning ride to Te Anau and Fiordland's primeval landscapes. This is one of the few places on the planet of untouched wilderness. Waterfalls tumble hundreds of metres into pristine forested valleys. The mirror surfaces of the fiords reflect the majestic towering mountains the word 'silence' takes on a different meaning. Te Anau to Milford Sound - Te Anau 118km/73 miles: Ride along the shores of Lake Te Anau, through the famous Homer tunnel, and down to Milford Sound. The mountainous views on the road to Milford are almost as impressive as the Fiord itself. Keep an eye out for kea, an cheeky alpine parrot with a taste for rubber and plastic. On an Elite Tours your cruise around Milford Sound is included. 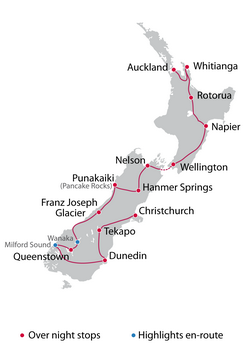 Te Anau to Dunedin 288km/178 miles: Today's route is a curvaceous ride that winds through central Otago to the very Scottish New Zealand city of Dunedin. Here Victorian architecture and the lovely Otago Peninsula makes this a exceptionally attractive place to visit. We pass through the fly- fishing capital of New Zealand - Gore where we stop for lunch. Free day to explore Dunedin: Dunedin is the heritage and wilderness capital of New Zealand. You can choose to explore the city or ride out to the Otago Peninsula to visit the Royal Albatross Centre and yellow - eyed penguins. The Peninsula has winding roads with stunning coastal views, while the city has historic buildings, museums and art galleries waiting to be explored. Dunedin to Tekapo 285km/177 miles: Leave Dunedin for a great ride over the Maungatua Ranges. The area is typical of the dry Maniototo region - sparse, tussock clad, rolling hills. Stop at Cromwell the 'fruit bowl of New Zealand'. Then take on the Lindis Pass, the saddle with alpine landscape between Lindis Valley and the Ahuriri River to Lake Tekapo. Tekapo to Christchurch 226km/140 miles: Lake Tekapo offers fantastic views of Mt Cook Aoraki - New Zealand's tallest mountain. At the Church of the Good Shepherd, admire the bronze sheep dog statue and views of the turquoise lake. Ride on to Christchurch via Burkes Pass and the Canterbury plains. Arrive early in Christchurch and say your goodbyes over a farewell meal.